Limassol, Cyprus (Sept. 4, 2006 - Interior Communications Electrician 3rd Class Steve Chisholm (bottom) and Electronics Technician 3rd Class Joshua Miller paint the exterior walls of the Theotokos Foundation in Limassol, Cyprus, as part of a community relations project. About 50 service members and civilian mariners from USS Mount Whitney (LCC/JCC 20) and the embarked Joint Task Force (JTF) Lebanon staff participated in the painting of the residence. JTF Lebanon is responsible for the U.S. military aspects of the joint interagency efforts of the Department of State and the Department of Defense, which have resulted in the assisted departure of almost 15,000 American citizens from Lebanon and the distribution of millions of dollars in aid to the Lebanese people. U.S. Navy photo by Gunner's Mate 2nd Class Elizabeth Vlahos (RELEASED). 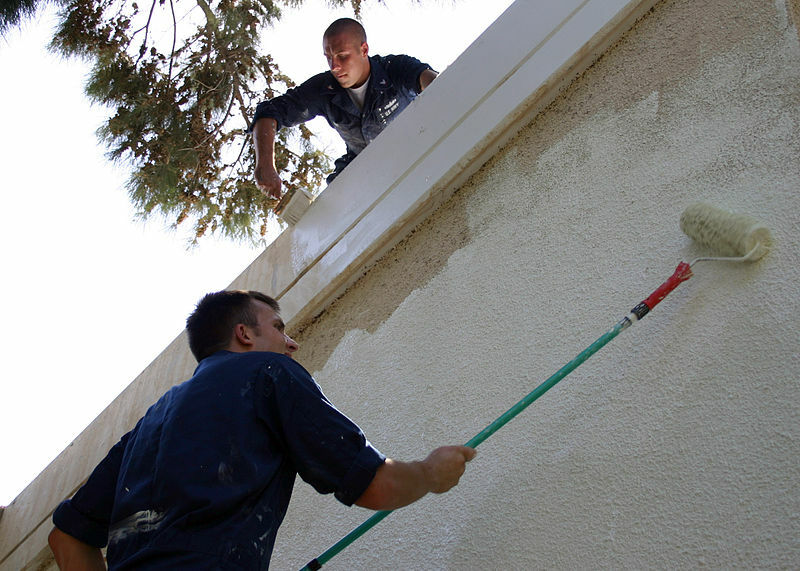 The image US Navy 060904-N-3594V-001 Interior Communications Electrician 3rd Class Steve Chisholm (bottom) and Electronics Technician 3rd Class Joshua Miller paint the exterior walls of the Theotokos Foundation in Limassol, Cyprus.jpg was found on Wikimedia Commons.